1 “New York, Passenger Lists, 1820-1957,” digital images, Ancestry.com (http://www.ancestry.com : accessed 23 June 2014), manifest, S.S. Allemannia, Hamburg, Germany, to New York, arriving 30 June 1870, Christe Schmidt; citing National Archives microfilm publication M237, roll 331, line 38. 3 Maureen Taylor, Fashionable Folks: Hairstyles 1840-1900 (United States: Picture Perfect Press, 2009), 102-103. 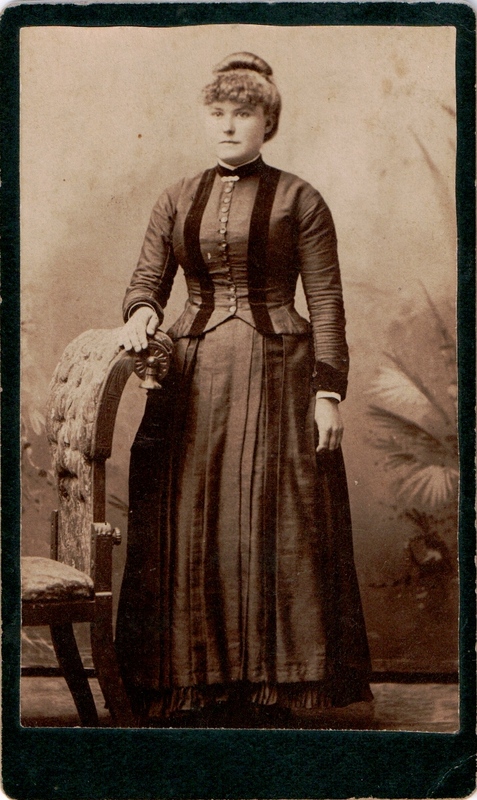 4 Joan Severa, Dressed for the Photographer: Ordinary Americans and Fashion, 1840-1900 (Kent, Ohio: Kent State University Press, 1997), 424. 5 Severa, Dressed for the Photographer, 379. 6 Wedding Portrait of Fred and Christine [Schmidt] Nelson, South Dakota, March 1890; digital image 2010, privately held by Melanie Frick, 2014. 7 Maureen A. Taylor, Family Photo Detective (Cincinnati: Family Tree Books, 2013), 52. Neat photo and that she has both your & Natslie’s middle names!